Covering an area from Nevada County south to Tuolumne County, this beautiful region is home to some rowdy and exciting whitewater rivers. Including a rafting trip is sure to add adventure to any vacation when visiting well known areas such as Apple Hill, Marshall Gold Discovery State Park or various wineries from Camino through the Shenandoah Valley near Plymouth, Ca. Some wineries have been thriving since the Gold Rush in Amador County. 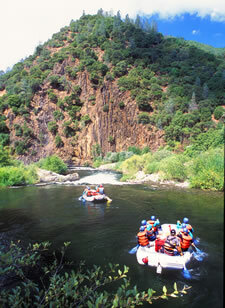 The Middle Fork American River offers intermediate Class III/IV whitewater with rapids like Tunnel Chute. Taking a trip on the North Fork American River in April and May when this Class IV section is at its peak is a great way to start off the rafting season. Close to the Yosemite area and hankering for whitewater? Take a Class IV whitewater trip on the Tuolumne. For experienced water sport enthusiasts, the adrenaline filled Class V rapids of Cherry Creek offer the ultimate rafting challenge.